A Scandalous Emperor but a Great Lover? Aged 13 on accession on 19 June 1505 Zhu Houzhao became the 10th emperor of the Ming Dynasty. His official reign period named Zhengde ("Correct Virtue") commenced with the advent of Chinese Lunar New year on 24 January 1506. He was intelligent but loved pleasure and leisure. He soon left state affairs to eunuchs and later to his favorite military men, instead embarking on a life of entertainment, wine and women till his premature death in April 1521 at age 29. He became known as a great womanizer and even a great lover. He early on grew tired of his own harem and roamed the streets of Beijing disguised as a commoner in search of young girls. His guards were ordered to provide women for the Emperor's pleasure and on occasion the Emperor would even have prostitutes paraded in the palace. Already in a poor state of health from drinking, Zhu Houzhao became seriously ill after capsizing and almost drowning on 25 October 1520 while fishing from a small boat on a return trip from Nanjing on the Grand Canal. 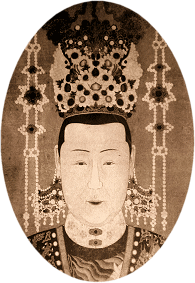 He never recovered and died childless in the Forbidden City on 20 April 1521, a mere twenty-nine years old. The tomb follows the traditional layout with the ceremonial area in front of the actual burial area. Furthest south is the memorial stele from where the "Sacred Way" leads to the front entrance, now long gone apart from its platform. Only the stone platform of the main sacrificial hall remains in the ceremonial area. Even the bases of the east and west side wings are gone. Three gates in the dividing interior wall allow access between the two areas. The Double-Pillar Gate and the symbolic stone vessels also vest on the Sacred Way, which ends at the base of the soul tower. The "Precious Mound" is an odd oval shape. Slightly east of the site and between the memorial stele and the front entrance was the Sacred Kitchen. Nothing remains of this structure which is now a farming field. The Zhengde Emperor was interred along with Empress Xia (died 1535) at a northern location of the Ming imperial cemetery. 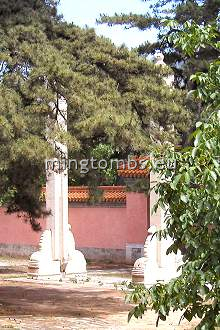 The name of the tomb is Kangling. 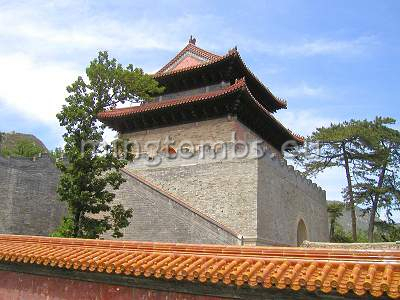 Kangling mausoleum sits snugly at the foot of Mt. Jinling ("Golden Ridge") of Tianshou Mountain (photo right). It covers a total area of some 27,000 square meters. The construction of the tomb started just after the Zhengde Emperor's death in April 1521 and was completed in June 1522. The layout is shown in the yellow box left. Almost all of the original above-ground structures have long since collapsed, but a major rebuild is ongoing at the time of writing this in July 2006. 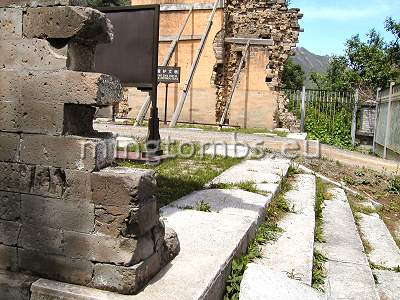 Some of the main structures have already been fully reconstructed or restored, as can be seen from my photos here. 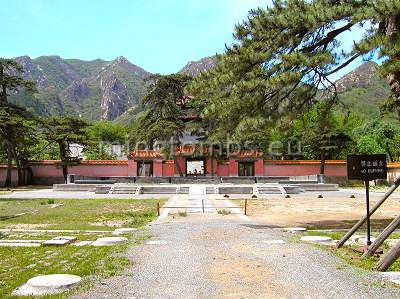 The photo top right takes in the main scenery looking north on the Sacred Way with the ceremonial area in the front, the soul tower almost completely hidden behind the trees and Mount Lianhua in the back. The restored three gates in the wall dividing the ceremonial area from the burial area are also clearly visible. The stone platform and a small part of the back wall of the ceremonial hall ("Ling'endian") is clearly visible on the photo. The hall itself is long gone, but from the base stone pillars we can see that the hall was five bays wide and three bays deep. The photo top left shows the only main structure left relatively intact; the memorial stele erected on top of the traditional turtle figure. Interestingly, the later Ming steles carried no inscription. Note that the usual square building housing the stele has collapsed leaving only the original stone platform and stairs. The photo above right shows the restored soul tower ("Minglou") and the western external stairs that lead from the burial area to the tomb mound. At the southern base of the soul tower were the sacrificial stone vessels as well as the so-called Double-Pillar Gate ("Lingxingmen"). The original wooden doors of Lingxingmen have completely rotted away but the pillars remain perfectly intact now some 500 years later. The purpose of erecting Lingxingmen was to seek blessing from the Lingxing Star for a good harvest, a custom stemming all the way back from the the Western Han Dynasty (206 BC - AD 25). 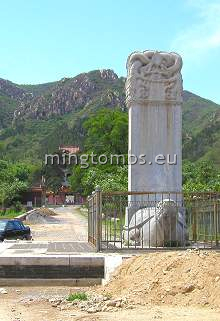 In Kangling the gate furthermore symbolized the importance of the tomb occupant. The five stone vessels are also intact and on their original platform. They are visible through the gate on the photo at the top right of this section. Considering his life with innumerous prostitutes and concubines it is hardly surprising that Zhu Houzhao only took one formal wife, empress Xia. 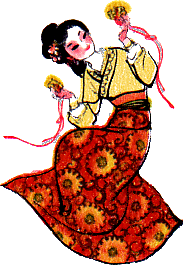 She was from Nanjing, Jiangsu Province and became empress in 1506 right after Chengde's accession. She died childless in 1535, 14 years after the death of her husband. 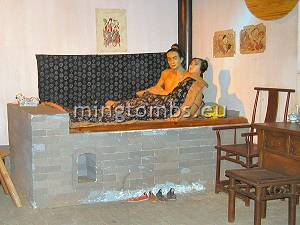 She was entombed in Kangling along with her husband. Not much else is known about her. Kangling has never been opened after year 1535 but legend has it that both grave robbers and an insurrection army have entered the site. Only the eastern and western side walls of the front entrance ("Ling'enmen") remain, but the entire hall will presumably also be rebuilt. From the extant stone platform and plinths we know that it was three bays wide and two deep. A full-width flight of stairs with four steps led up to the platform. The site is not open to visitors due to the ongoing restoration. I can however recommend to walk alongside the surrounding western wall as there are several spots on the way from where you can get a good view of the interior.